Speaking to a packed house at Denver’s Mercury Cafe yesterday, Dr. Jill Stein, Green Party candidate for president, puled no punches in going after rival Hillary Clinton and the “two corporate political parties funded by the corrupt banks and the fossil fuel companies.” Stein’s speech was marked by almost continuous applause and multiple standing ovations as it hit on almost every issue at the heart of grassroots Democratic activists. 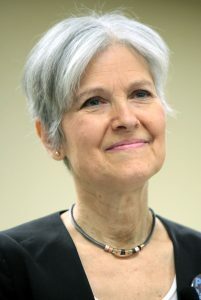 Amendment 69, reducing the size and power of the American military, minimum wage, restrictions on the oil and gas industry, solar powered public transit, and police violence were all touted as things that a Green Party administration would tackle early in a Jill Stein presidency. In a thinly veiled swipe at Hillary Clinton, Stein said that ISIS was created out of US mismanagement of situations in Lybia and Iraq. Ouch. Complaints about the nation being extorted and taken over by the military-industrial-security complex. Politically, Stein laid out her path to victory by recognizing that Bernie Sanders supporters brought progressive ideals to the forefront of this year’s Democrat presidential primary, while the Green Party has the campaign infrastructure already in place ready to embrace those disaffected liberal voters. Stein ultimately hopes that liberal voters will look past Hillary Clinton as a lesser of two evils, and pull the lever for her as a candidate who truly embodies leftist values and goals. We wish Dr. Stein the best of luck…in peeling off would-be Hillary voters.